All of the animals of the arctic are planning a party and they've invited you as an honored guest. Click here to play! Spin these reels for a fabulous time and a chance to bring home plenty of valuable presents! The Polar Bash logo is your ticket to a good time. Spin this symbol two to five times across an active pay line and you'll pick up a maximum of 12000 times your line bet. Don't forget to make the rounds to party with all of the special guests because spinning these party animals across the lines will pay out big time! 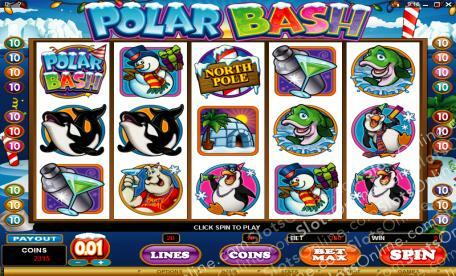 Spin two to five partying polar bears to get up to 5000 times your line bet. Two to five tipsy penguins will get you up to 2000 or 1000 times your line bet. Walruses and wolves also pay out. The former grabbing up to 750 times your line bet and the latter getting up to 500 times. There are plenty of other symbols to help you celebrate a good time, including whales, snowmen, igloos and cocktails. You'll also want to keep a close eye out for the North Pole symbol. This sign will trigger a number of free spins in which you'll be bringing in plenty of big wins. Don't forget the fish! Three of these special symbols will trigger a bonus feature in which you have a chance to play for up to 15000 coins. So, pull on a wooly sweater and hat because it's time to party in the arctic for a chance to win big! If you can spin three or more North Pole symbols on adjacent reels, you will trigger 25 free spins in which prizes are doubled. If you spin this symbol anywhere on the board, it will multiply your total bet. Spin three or more fish on adjacent reels and you will trigger the Ice Fishing Bonus. During this round you will go ice fishing for bonus coins. Pick three of the fifteen holes to reveal your prizes beneath the ice. You could win up to 15000 coins!